Warning! This soap is addictive! So use it at your own risk. Terms and conditions apply. The “addictive” soap is none other than Mohalalitoe (oa lithota). It is a new natural soap that is being produced by the National University of Lesotho (NUL) Innovation Hub. Since it is a natural soap, it is very gentle on your skin. And it leaves your skin fully moisturised. Find their soap at Unique Jewellery, NRH Mall Kiosk, near Ha Mafafa, Maseru. More places will be announced soon. Hence the befitting name, mohalalitoe (actually this is a Sesotho name for a plant which scientists, in their typical tendency to complicate otherwise simple things, call Zantedeschia albomaculata). Well, it also has an English name too; spotted calla lily. Legend goes that mohalalitoe is one, if not the only, plant that is universally and traditionally loved and worshipped by Basotho of all colours and creeds. Try it once and chances are, you are going to throw away a collection of “soaps” you have in house down the garbage bin, which is where they belong. For a reason. Your conventional “soaps” are not soaps at all. Believe us. They are detergents. We will tell you why in a short time. Back to the natural soap story. Natural soaps are great but they have a weakness of coming at a hefty price. So they are normally not within reach of an average guy in the street. Not Mohalalitoe. “It is as good a natural soap as others in the markets, but it costs three times less,” said Lesia Matlali, one of the researchers who spent years developing Mohalalitoe along with ‘Marethabile Jane and Setlhare Jane. These scientists did not develop mohalalitoe overnight. They spent four good years on the process—four good years! The idea was not only to make the best product. They had to figure out how to make the best with the lowest cost. Whereas making soap is no rocket science, making Mohalitoe is. Think about this reality that the developers had to confront. 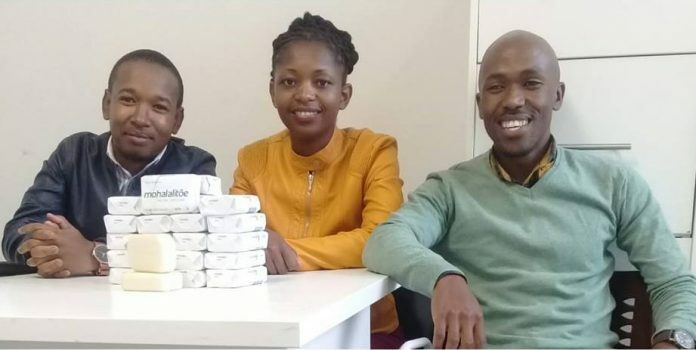 “We were not only faced with the choice of making high quality low cost soap, we also had to grapple with the issue of producing our own machines to make the soap,” said Setlhare Jane, who focuses on process development in a number of businesses at the hub. Had they tried to buy off-the-shelve soap-making machines, that would have cost them a fortune. But, as we all know, unlike some privileged varsities out there, NUL is not famous for having a big purse. That is not so good but, guess what, the very essence of innovation is creating a fortune out of nothing, sometimes literally nothing. “In our determination to mass produce the soap, we were no longer developing soaps only, we were also developing machines and processes to make those soaps, a tedious and tricky process indeed,” said the soft-spoken ‘Marethabile Jane who has some kind of an emotional attachment to Mohalalitoe. These folks had to gather technicians and engineers, locally and internationally and worked with them to develop the right kind of machinery. “The result is that we now have machines that cost twenty times less than what we would have paid, had we chosen a traditional route, ” she added.